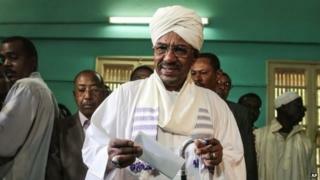 Sudan's President Omar al-Bashir has been re-elected with 94% of the vote, according to official results. The country's main opposition parties boycotted the elections, saying they would not be free and fair. Turnout was officially 46% but BBC Sudan analyst James Copnall says many believe the real figure was even lower. Mr Bashir, who has been in power since 1989, denies International Criminal Court (ICC) charges of ordering a genocide in the Darfur conflict. Western countries, including the US, Britain and Norway, criticised the polls for not being free and fair. The African Union monitors said that basic freedoms and human rights would have "enhanced" the polls. Most Western countries will not accept the elections as meaningful, but 71-year-old President Bashir can count on support from the likes of the Arab League, and Russia, says our correspondent. The ICC arrest warrant for Mr Bashir relates to the Darfur conflict, which began in 2003, and in which the UN estimates 300,000 people died and more than two million displaced. The African Union (AU) has rejected the ICC's attempts to have him arrested, arguing that Mr Bashir enjoys presidential immunity and therefore cannot be tried while in office. In December 2014, the ICC dropped its investigation into the crimes, blaming inaction by the UN Security Council.